I first found out about Tension & Trauma Release Exercises (TRE®) in 2018 around the time of the Dr. Blasey Ford hearings and Brett Kavanaugh confirmation. I was looking into therapies to help survivors (including myself) handle the stress and trauma some of us were reliving by watching the hearings. I asked for advice on a facebook group called Bay Area Feminist Healers and Health Care Providers. 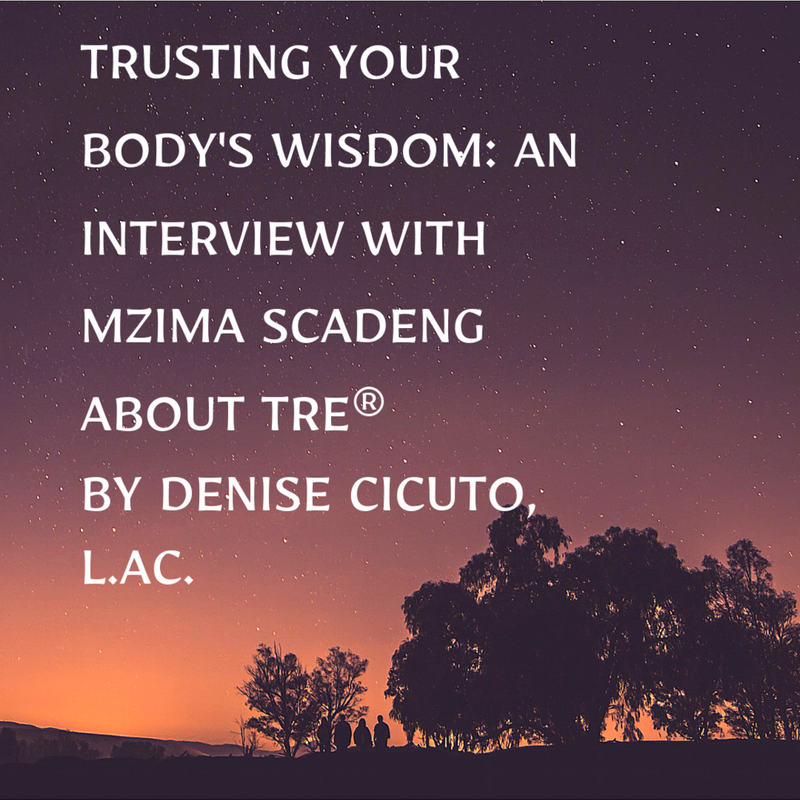 Mzima Scadeng of Your Body Knows How replied asking whether or not I knew about TRE®. Here is an interview I did with Mzima to find out more about her work. Can you tell us who you are and what you do? How do you pronounce your name? My name is Mzima Scadeng. “Mmm” like something’s good and “Zima” like the drink from the ’90s. I have a private practice in Berkeley where I offer two modalities TRE® and also channeled energy healing and Reiki. How did you hear about TRE®? I grew up as a very sensitive child. My neighbor stepped on a ladybug in front of me and I burst into tears. I really empathized with anyone and every creature and I had a really hard time processing all of that. I really wish I had a tool like TRE® growing up. I think of this invisible balloon inside of us that gets filled up throughout the day and throughout our lives and it feels like it wants to explode if we don’t release the pressure from it. I feel like TRE® is the amazing tool to release some of that pressure. I went to my first workshop and I was hooked. It’s something that’s built into our bodies. This is something we were born to do as mammals. We’ve just forgotten how. TRE® is kind of the shortcut to remind your body that you have this tremoring ability and this relaxation technique. I was just excited to be able to help remind other people that they have this ability. Were you already doing Reiki and energy healing and then added this to your practice? I was. Yes, that’s correct. I started doing Reiki professionally in 2011 and I believe it was 2013 when I started TRE®. Do you see people individually and/or in groups? Yes, to both. Mostly individually. This year I will be offering more groups. I find some people prefer to learn TRE® one-on-one for privacy, for a more intimate setting. They can really focus on their experience and not potentially be distracted by anyone else’s. Other folks really enjoy the community aspect, either because it’s cheaper to go to a group than a one-on-one. Some people, especially if it’s a group that meets regularly, it’s kind of that support system. And then there’s something kinda cool that happens when you do TRE® in a group. It’s almost as if your body subconsciously takes hints from other people. For example, someone who may have done TRE® before finds that when they’re doing it in a group “Oh! My body is doing things it’s never done before.” And “My body didn’t realize it was an option to move in this way, or this part of the body could get involved.” Because you’re witnessing other people having that experience, it’s almost giving your body permission to almost expand what’s happening for it. So yes, I do offer both and folks kind of experiment with what works best for them. Should people go to your website to find out about the groups you’re going to be offering this year? Yes, and if they’re not in the East Bay, or if they need something that works better with their schedule, traumaprevention.com is the international TRE® website and from there you can find both TRE® providers to do one on one sessions with and workshops in your area. Often TRE® providers will list workshops on that site as well. How far apart do people typically have appointments with you? It does depend. Often people, when they’re first learning it, they find it helpful to come once a week for at least three weeks, or every other week for at least three weeks just to keep the momentum going, you don’t completely forget what you learned before. It just gives your body a chance - when they’re close enough together - kind of the cumulative benefit of it but then not so close together so you’re giving your body some processing and integrating time in between. And then once folks have learned it, some people take it home and it’s a lifelong tool that they use on their own. Other people enjoy continuing to come in for sessions and usually end up spacing it out a bit more at that point, whether it’s every few weeks or every month or something. When is it good to practice TRE® on your own? What are some examples of situations? I think that we all are facing stressful situations, most of us, all day long and we’re not even aware of the tension we’re holding in our bodies because of it. Sometimes there will be specific instances like “Whoa! That was an almost car accident.” or “Someone just yelled at me.” or “I have this looming deadline.” or “I just opened a bill I can’t pay” or “My kids are driving me crazy.” There are so many day-to-day things that happen along with the more chronic sources of tension and trauma and stress. It’s really about what opportunities can we fit it into our lives. In the beginning, often people will go through the whole set of exercises and then have the tremoring experience for 5-15 minutes along with the exercises. So it may be a half hour that you cut out of your day, or placed into your day, so that you can have that for yourself and wherever you can find a comfortable space to do it. That might be in your bed, or on the floor in your home, or reclined in a parked car. And then as people get more comfortable and more used to it, you may only need one or two exercises or no exercises and you can just go right into the tremoring process, in which case you might only need 5-15 minutes to fit it in. And then you may not even necessarily need to be laying down to do it. So it could be done in a bathroom stall, or in your office, or sitting up somewhere. Because it’s using kind of a subconscious part of your brain, or rather, an unconscious part of your brain, some people like to watch TV while doing it. You don’t have to have your brain actively involved in what’s happening with your body, so you can potentially multitask, although some people really enjoy being present with what’s happening with their body. So it doesn’t have to just be about the TRE®? You can do it while doing other things, or you can do it surreptitiously. Right, and it can be a preventive thing. You can make it a practice where “Every day before bed I spend 5 minutes tremoring so that I’ll sleep better, or discharge from the day.” Or it could be “I do it in the morning before work so I go into the day more relaxed and more resilient.” Or it could be “I know at 2 o’clock I’ve got a meeting or a conversation that’s causing me anxiety and I’m gonna spend 5 minutes shaking before and after that so I can go in calmer and discharge the tension that’s built up from that.” Or in my case when I’m losing my patience and not being the kind of mom that I want to be and my daughter’s giving me feedback that shows me that, I’ll excuse myself and go and shake for 5 minutes so that I can be a better, more patient mom. Do people need any special equipment to do this? Do they need special padding? No. Everybody’s bodies are a bit different in how much comfort they need when laying on the floor. Some people are just fine laying on the floor, some people would like to have a yoga mat, some folks need a few cushions to support various parts of their bodies just to make them more comfortable, but there’s no required equipment, which is one of the reasons that’s made it so accessible to so many folks around that world is that you don’t need a whole lot for it. You just basically need your body and the know-how and you can do it pretty much anywhere you have space to lay down. What is the difference between practicing at home versus with you in a session? When first learning TRE®, some people are comfortable learning it either from a book or a video. Other folks have other reasons for wanting more support. Some of the reasons could be that they need modifications or adjustments to the exercises to make it more comfortable for their body. It could be that doing any kind of releasing might bring up some overwhelm or fear that around potentially having emotions come up so they just feel safer having somebody with them. That being said, often folks experience TRE® and don’t have any emotional response at all. Other folks might have, just because your muscles are becoming so relaxed there might be some emotion trapped in your body that’s kind of coming to the surface and it may be a really pleasurable experience or it may be just kind of a healing experience that still feels manageable and good to you. There is a potential for some folks for it to become overwhelming or scary and so having somebody there who can help you learn to self-regulate can be really important. In general, it’s this idea of ‘how can I listen to my body, feel in control of the physical and emotional experience that I’m having and not be overwhelmed by it and how to feel comfortable and safe in your body while having whatever experience it is. That may mean practicing starting and stopping when it feels comfortable to do that. You remember to check in and stay present in your body not kind of disassociating. Somebody who is trained as a TRE® provider can help somebody learn to do that or remember to do that. There’s something about accountability of making an appointment with somebody, of setting that time aside, of going outside your normal environment that really just sets you up for success. And there aren’t any big distractions, that you actually will stay with that process for the whole time while it’s feeling good and some folks find that they’ll do it more often or more accountably or they just have a fuller experience by having someone witness them and hold space for them. Do you have a specialty you focus on in your work - certain groups of people or communities? Yeah, I tend to work a lot with sensitive women (emotionally or energetically sensitive folks) - kind of porous, when you take in a lot that’s around you. And I really enjoy providing safe, empathetic spaces for those folks. I tend to work with a lot of moms, maybe because I am one. And then folks who tend to be in the position of caring for other folks, whether that’s a mom or alternative practitioners or teachers or caretakers; folks who kind of take in and take care of a lot and who are needing opportunities to release some of that. Do you combine this work with Reiki? Often folks do come for both, sometimes in the same session. Often if you’re first trying it out, I encourage you to do it separately, mostly so you really get a good sense on how your body feels after each one so you’re knowing what is causing those feelings or that experience. I used to talk about it as a release and receive. The TRE® is releasing and the energy work is kind of filling your cup back up with good stuff, but we also have the experience that there is releasing that happens in the energy work as well. Yes, I offer both in the same space, often to the same client, sometimes in the same session. I would just encourage folks to watch some of the videos either on my website or on the International TRE® website to get a clear picture of what this is. And I want to mention that one of the reasons that people like this way of releasing and potentially healing from tension and trauma is that there’s no requirement to talk about or remember or kind of re-experience any of the experiences that you’ve had. Any provider that you’re working with should make it a priority that you’re safe and comfortable the entire time you’re there. So rather than it being this cathartic, emotional, let’s rehash everything you’ve been through, and cry it out - it’s not that. In fact, some people giggle through the entire time, or tripping out on how interesting it is to have your body move on its own in this way. We really make it a priority for you to feel safe and comfortable and for you to be in control. So even though you’re letting your body intuitively move in the way that it best knows how, you can start and stop at any point. We’re constantly checking in with you to make sure that you’re still feeling safe and comfortable. 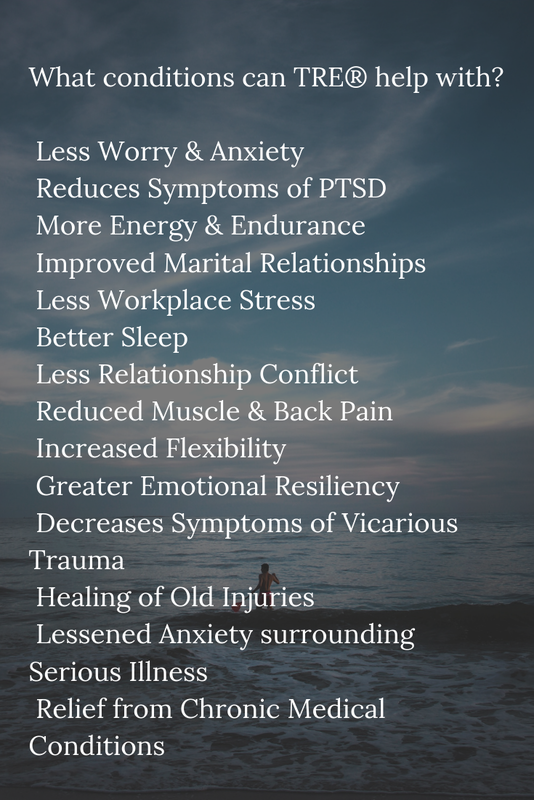 There’s nothing to fear in it even though the topic of tension, stress, and trauma can feel really scary, the actual experience of TRE® is designed to be simple and not scary. How can people contact you and learn more about your work? Thank you very much, Mzima.